What’s your made from? Solid wood or laminates; traditional tonewoods or responsibly sourced timbers; cheap wood; something exotic? And that might just be the top/soundboard! When you take into account the back and sides, neck, fingerboard, bridge and tone bars you could have a myriad of different woods on your guitar. Over the last few years it has been increasingly hard (and expensive) for guitar makers to get hold of traditional tonewoods – both for electrics and acoustics – and some woods, like Brazilian Rosewood, have gone for ever as it is a highly protected wood. The recent CITES rule changes may signal the end for rosewood altogether on ‘affordable’ guitars – rosewood features on fingerboards, sides, backs, bridges and decorative parts. Your solid body electric might be made from alder, swamp ash, mahogany, poplar, maple and basswood and could have a maple cap/top with a fancy veneer. Semi-acoustics are traditionally carved, pressed or laminated to produce the arch from a variety of woods (Godin use wild cherry for example). Cheaper electric guitars can often feature woods such as plywood, pine or agathis, which, not being hardwoods will affect durability and tone. And of course any material can be used to make a guitar such as plastic and metal, and even cardboard has been used in some instruments. 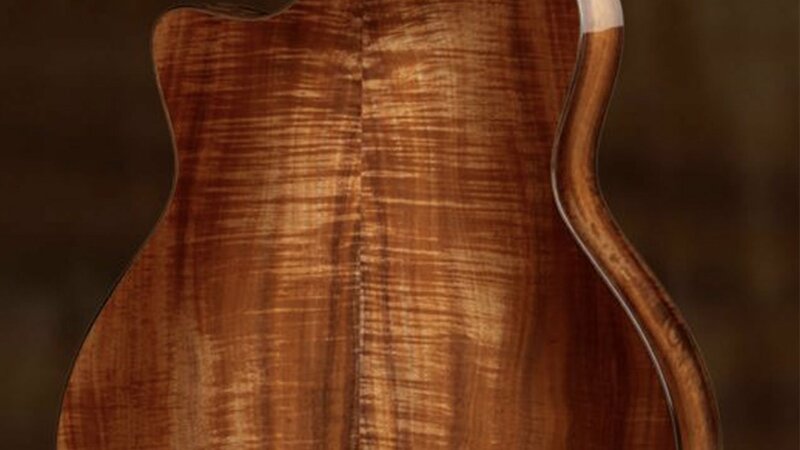 Your acoustic could feature spruce, cedar, mahogany, maple, sapele, ovangkol, koa, walnut or a new sustainable wood should as paulownia (found on Mariner guitars) on the front back and sides; mahogany, cedar or maple for the neck and rosewood or ebony for the fingerboard. All of these woods – and their combination – affect the ‘tone’ of your guitar and so are chosen carefully. Some pieces of wood are naturally better acoustically which contributes to the sound of your guitar. Cheaper guitars tend to have laminated woods for the body. Confused? When you take into account the ‘different’ tones that each body wood has – from bright, glassy, mellow, deep, warm and so on – you can be forgiven for thinking that you thought a guitar was a guitar! Some players will swear by a certain wood for the body or neck or fingerboard but could us mere mortals really tell the very subtle differences? And is one tone better than another or merely personal choice? When I bought my first proper acoustic I wasn’t bothered where it was made or what from (or what it said on the headstock); more important was playability and sound, relative to its cost of course. Nowadays I am more selective as I know more, but is that a good thing….? Could be why we all want lots of guitars though.